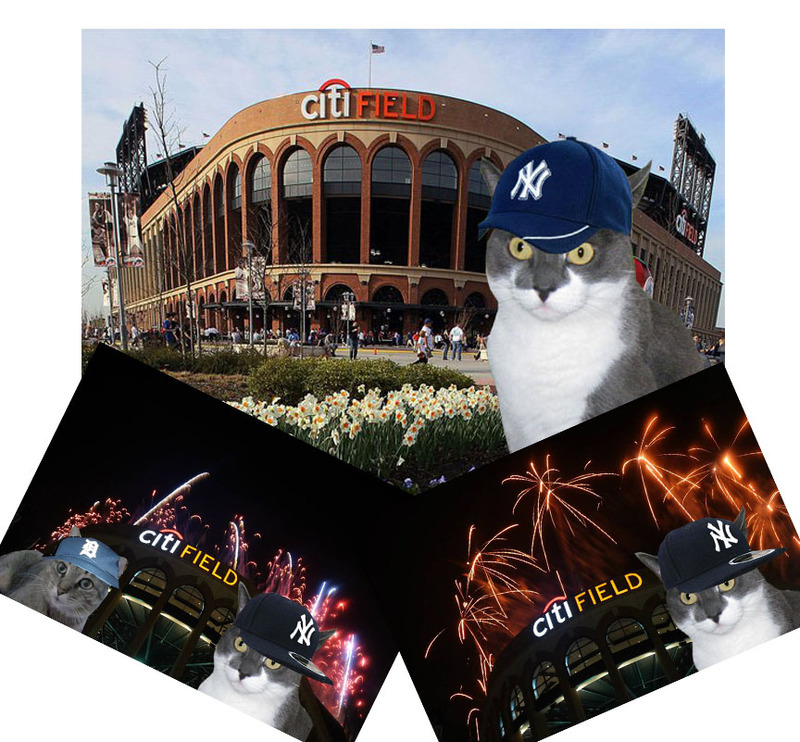 I got my Yankee hat and my 'tude and I'm off to Citi Field to meet Abbi. Who's on 1st. CK is. OK, so the title is a bit of a stretch. Today is Major League Baseball's All-Star Game and this one is being held in Shitti Citi Field in Queens, where NY's minor league team, the Mutts Mets play. The most popular best players in baseball play this meaningless game that decides home field advantage in the World Series. This year two of our Yankees are on the team even though only 1 deserves to be on it. What can I say about the Yankees? Half their starting pitchers have lost it and one never had it. Fielding? Yeah, they can catch most of the time. Running? They're old and they go station to station. Hitting? HAH! You've got to be kidding. 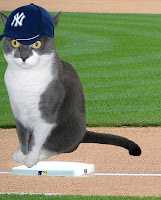 The Musings of a Crazy Cat Lady, whose Tigers are doing quite well, and I are posting about this game cos we're big baseball fans and we think it will be fun. I secretly think that she's just trying to rub it in to me that the Tigers are finally better than the Yankees. Let her have her fun now cos this kitty can talk serious trash. Either way, we're both on the same side tonight. GO AMERICAN LEAGUE! Last night was what appears to be the highlight of the event the Home Run Derby, which was won by Yoenis Céspedes of the Oakland A's. I know many of my furrends and readers aren't baseball fans but what's not to like about grown men chasing balls all over the nicely manicured lawn. We cats and woofies would love to be out there if we had a chance. This brings me to the story of one who did. The Yankees' minor league affiliate the Trenton Thunder's beloved bat dog, Chase That Golden Thunder, went OTRB on July 9th, just days after the team held a retirement party for him. Chase had been retrieving bats for the Thunder for a decade and was diagnosed with cancer in February. He's survived by two sons, Derby and Ollie, both of whom are bat dogs. Derby will take over in the role for the Trenton Thunder. The team axed fans wishing to honor Chase to donate to an animal shelter/pet rescue in their local communities. Sorry to read about Chase. Have a terrific Tuesday Keisha. That was so sad about dear Chase. Hey CK, you are All Star all the time! 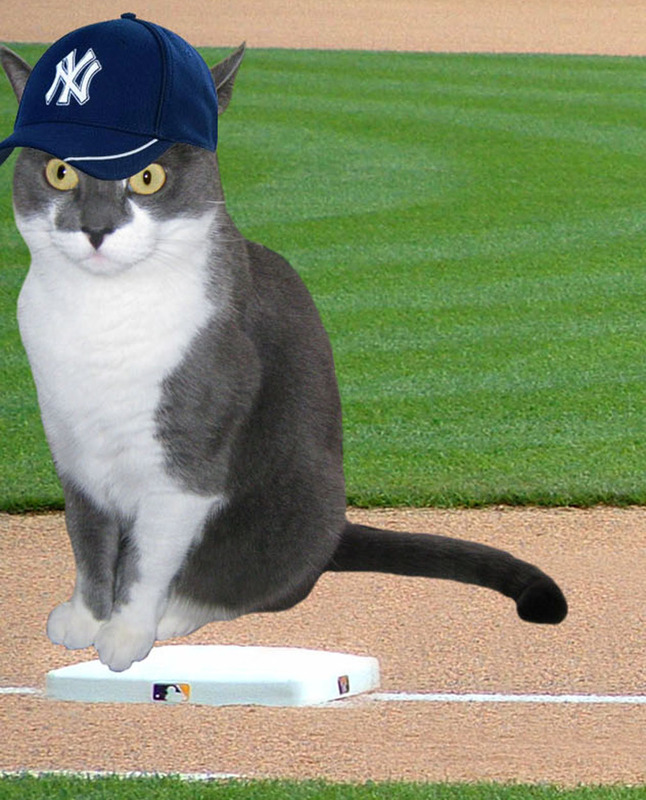 OMC, we didn't know about Chase. That's so tragic. Nope, we're not trying to rub anything in. My Tigers do the most stupid things... so many that I can write pages and pages. GO AMERICAN LEAGUE! That's so sad about Chase. Have a wonderful Tuesday, CK! N whoa...sum oh de bats bee az long as him huh !!! nice mewvie bout him !! Looking pretty sporty CK! Sorry to read about Chase, we know his sons will continue in his legacy. Hey, that lady & my MomKatt should get together. She's a RABID Tigers fan y'know. And we'd NEVER rub it in; I mean, you guys have MARIANO! GO AMERICAN LEAGUE! MomKatt left work early to see all the hoop-lah on the MBL Network - red carpet, pre-game, the whole 9 yards. And MAX SCHERZER! We're very sad to hear about Chase. We're glad that his sons will be carrying on the tradition. We're with you. Go AL! We is Yankees fans too. Well sept Jazzy, she duzzint care bowt sports. I like baseball and Finny likes to watch cycling wif mom. Mom lived in Mishgan for a wile so she likes the Tigers too, but mostly the Yankees. Have fun watching the game! My boyfriend likes sports, but me not so much lol. I have actually been playing softball a little lately... OK not really, just playing catch. But after a lot of years of not catching a softball with a glove I think I do pretty good. Except for when I missed and the ball hit me on my forearm. My boyfriend threw it pretty hard too. Anyways, I didn't know that there was such a thing as bat dogs. That's pretty cool! That is sad about Chase the dog!! You're always our all-star, CK! That's quite sad about Chase. Do you think they would consider bat cats? We have hard that bats fly in the air at night and are fun to chase. Oh, not that kind of bat? Nevermind, then. Oh no - so sorry about Chase. Our daughter and son-in-law have a young baseball player living with them this summer - he plays for the Timber Rattlers in Appleton WI. So we've been following that team some. Well, CK...you know us Island Cats are HUGE Tiger fans. We mean, we're cats...of course we gotta root for cats, right?? It only helps that they're our home team, too! The mom is watching the game right now...and the AL is winning! YAY!! Aw, I was glad to hear Chase had two bat-doggy sons! The "Giants" (Dwarfs) have four players on the NL team and that is at least 2 too many. I hope Bochy enjoys himself tonight because I don't think he is going to have much fun for the next couple of months. Right now the NL's down 2-0 and frankly we don't even care. We're sorry to hear about your friend. But we also think you look great as a baseball player! great post CK! Even though I now live in Detroit and am forced by living here to be a Tigers fan...I'm still an Indian at heart. My Dad was from Brooklyn and literally LIVED at Ebbet's Field and I was his gift in 1955 when the Dodgers won the World Series. I can't wait till 9:30 (my time). I'm trying hard to imagine your impawtant nooz--is it a secret so juicy I'll never be able to tell anyone??? We love your baseball look CK! That is sad about Chase but great that he has sons to carry on. I enjoyed seeing Chase. I remember reading about him in the paper. Rest in peace, sweet Chase. YOu are much loved. I was sorry to hear about Chase, but just thinking about all the old Yankee players out there who will see to it he is happy.